That certainly makes sense because Alvarez is only 5’9” compared to the 6’0” Chavez Jr., and Alvarez doesn’t come into his fights weighing anywhere near as much as Chavez Jr. does. I’m not sure how much Chavez Jr. weighed last night in beating challenger Peter Manfredo Jr. by a 5th round stoppage, but my guess is Chavez Jr. looked to be at least 170 lbs at the minimum. In his fight before this one, he scaled 180 lbs the night of his fight with Sebastian Zbik last June. I don’t think Chavez Jr. came in as heavy last night, but he still looked like a huge 170. You can’t have Alvarez facing a guy that big unless you’ve got a catch weight to even things up a little. Chavez Jr. changed his game around completely last night, showing a lot of movement in the first four rounds before he started to tire in the 4th. The movement pretty much stopped in the 4th, as Chavez Jr. became more stationary and started to mix it up. He got hit with a few really good shots from Manfredo in that round and showed some really poor defense. I gave that round to Manfredo. In the 5th, Chavez Jr. nailed Manfredo with a right hook while he was coming forward. The shot staggered Manfredo, causing him to back up against the ropes. Chavez Jr. then went after him and landed a flurry until referee Lawrence Cole halted the fight just at the moment that Manfredo finally started to clinch. I thought it was a bad stoppage but it really didn’t matter much. Manfredo Jr. was going to lose the fight anyway, as he wasn’t throwing enough punches and just looked slow. The win puts Chavez Jr. and his promoter Arum in a bind. They can’t keep facing B level fighters like Manfredo Jr. because the WBC supposedly told Sergio Martinez that he’ll be facing Chavez Jr. next. I seriously doubt that’s going to happen, because Chavez Jr. will be destroyed by Martinez. However, Chavez Jr. is going to have to fight someone good like Alvarez or Marco Antonio Rubio. Those guys would be a lot of trouble for Chavez Jr., even with his new style of fighting. He can’t circle the ring for 12 round continuous rounds without exhausting himself, and his defense is just as horrible as it’s always been. We already saw that Chavez Jr. was running out of gas against the B level Manfredo last night. Can you imagine what would have to Chavez against someone that actually punches back at him with good power? 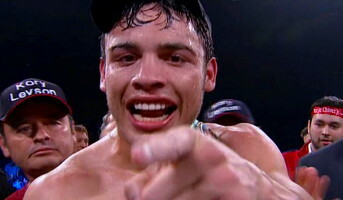 I don’t think Chavez Jr. would finish on his feet against either Alvarez or Rubio, and Martinez would annihilate him. Like I said, Arum and Chavez Jr. are kind of in a bind right now unless they can convince the WBC to allow for another opponent in the same quality range as Manfredo. I don’t know how long Chavez Jr. can be maneuvered around the better fighters without it becoming a total joke. Guys like Peter Quillin, Andy Lee, Rubio and Matthew Macklin can’t be avoided forever, and neither can Martinez. If I’m Arum, I’d do anything possible to get Chavez Jr. the fight with Alvarez so that I could cash out before Chavez Jr. gets beaten by one of the better middleweights in the division. Once he’s beaten, his earning potential will likely drop thereafter. That’s why you’ve got to get Chavez Jr. in against the biggest name possible before he’s whipped by a good fighter. He’s fought pretty much exclusively B level fighters his entire career and he’s got to fight the best fighter possible before he’s destroyed. « Is boxing a dying sport?